Gold (GC=F) has gotten a boost over the past three months, rising more than 4%, as investors flock to so-called “safe-haven” trades, and the commodity is headed even higher in 2019, according to strategists. “Volatility has reemerged across markets generally — commodities, equities, etc. If that volatility persists, it will be key. It is going to push investors to perceived safe havens like gold,” Chris Louney, commodities strategist at RBC Capital Markets, told Yahoo Finance. Fears of an economic slowdown coupled with trade worries between the U.S. and China have sent the U.S. stock market tumbling since October. All three of the major indices closed in correction territory, or down more than 10% from their recent highs, on Friday. “If U.S. growth slows, due to a sugar rush from tax-cuts as well as trade wars, then investors may continue to seek gold. 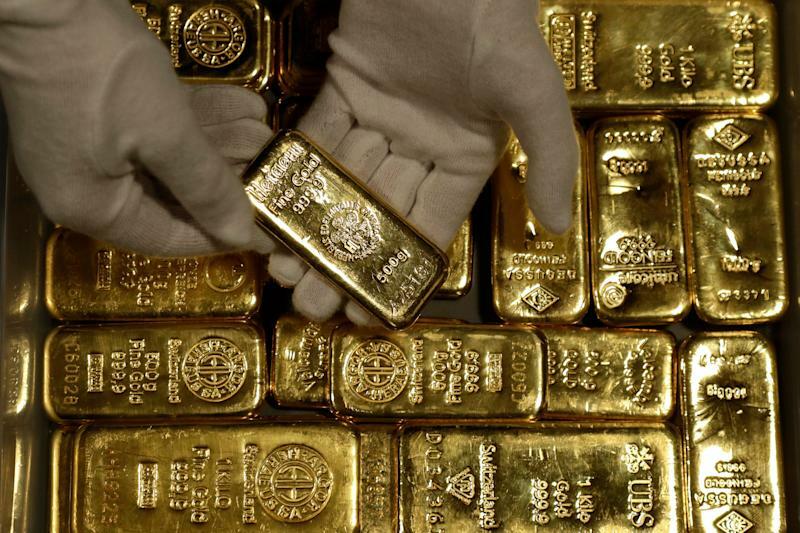 Meanwhile, a rapid economic slowdown could see gold flows match those seen during the 2008-2009 financial crisis,” John Reade, chief market strategist at the World Gold Council, said. Mikhail Sprogis, Goldman Sachs precious metals analyst, said the firm believes safe-haven trades like gold will continue to rise next year, whether or not the economy actually slows down. “Our bullish outlook is driven by the expectation of a pick up in ‘fear’ related investment demand for gold as the U.S. economy slows down and late cycle concerns mount. Even though we as a bank think that this cycle has room to run, this doesn’t prevent people from becoming increasingly afraid,” he told Yahoo Finance. Furthermore, investors are paying increased attention to the Federal Reserve as the central bank gears up to kick off a two-day meeting on Tuesday. While it is widely-expected that the Fed will raise interest rates at the conclusion of the meeting, the real focus will be on Chairman Jerome Powell’s language for next year’s rate hike plan. “We expect three rate hikes next year versus consensus of one to two. We think that this will not prevent gold from increasing. Moreover, we would like to highlight that negative correlation between gold and 10-year real rates tends to reverse during late stages of the hiking cycle as higher rates themselves can lead to increased financial market volatility and growth slowdown concerns,” Sprogis said. While Sprogis thinks gold will hold up in a rising rate environment, Harry Tchilinguirian, global head of commodity strategy at BNP Paribas, disagreed. “As the Fed continues to tighten monetary policy while other central banks remain on hold for now, the policy divergence may help to keep the dollar firm in the short term, which is negative for gold,” Tchilinguirian told Yahoo Finance. Tchilinguirian argued that because gold holdings in physically-backed exchange-traded funds have not picked up, there is no concrete proof to show that investors are increasing their long exposure to gold. “As such we continue to maintain a negative bias on gold in the short term, even as the yellow metal’s price has had some support recently from weakness in equity markets,” Tchilinguirian said. A strong dollar (DX=F) remains a headwind for gold in the coming year, according to Sprogis. “The gold market continues to be hurt by a strengthening dollar. A strong dollar affects gold by reducing dollar purchasing power of world ex-U.S.,” he explained. The price of gold and the U.S. dollar are inversely correlated. When the dollar’s value falls and loses value, investors often turn to alternative investments like gold. Despite headwinds like a strong dollar, both Sprogis and Louney think gold has more room to run in 2019. Goldman Sachs has an end of 2019 price target of $1,350 for gold, while RBC has an average 2019 forecast of $1,338. Gold settled at 1,251.80 on Monday.